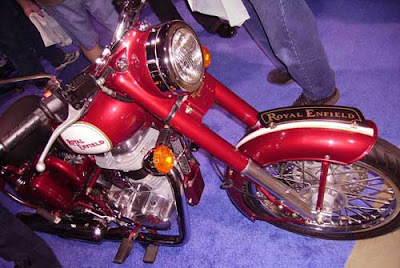 One of the Royal Enfield C5 motorcycles on display at the Los Angeles International Motorcycle Show was not stock. It had what I thought was a very classy white stripe across the fenders. Such a simple thing really altered its appearance, for the good, I thought. "That's a Scooter Bob thing," explained Kevin Mahoney, who was there in person, answering questions from Californians, who will be able to buy new Royal Enfields for the first time in 2010. 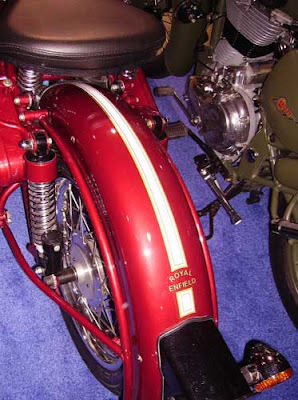 Mahoney is president of Classic Motorworks, the U.S. importer. "Scooter Bob" is nickname of Classic's engineering guru Greg Stewart. "It's just tape," Mahoney said. Just tape and a healthy dose of imagination. "Dave: Thanks for the kudo! No trick, really — I just have some sort of gift for that stuff — Hahaha!! It's 3M Scotchcal vinyl with the same variety of pinstripe applied over it. I WOULD clearcoat it if I had the time to do it. I think it looks QUITE spanky and I'm SURE doing it to any one that I can claim for MINE! I've only just begun to make mods on the lovely little C5!" I searched a lot for these decals, but could not find them for sale online. If you have customized them, please can you share the dimensions of the white stripes? I am located in India.